MormonInfo.org - FAQs - Shouldn't you be concerned about turning off more people than you can reach by your method? The simple answer is I would be concerned about turning people off if I really did not believe in the transforming power of the word of God. Preaching and carrying signs are traditional and legitimate means that God uses to save people, and I have seen it work with more positive results than negative. For those negative results, displaying the truth still serves a purpose in not allowing unbelievers to have an excuse when they stand before God. The all holy Judge will not make allowances for unbelievers who didn't like some evangelist's approach. This is not to give carte blanche in doing whatever to get the gospel out (although there is still something to rejoice over even when it goes out via improper ways as Philippians 1:14-18 say). Rather, it is simply to say that blaming the actions of others is not going to cut it before God. But even if it won't cut it, why would I still do things that may repel people from accepting the gospel? I suppose an answer might be, the biblical preachers did not seem to worry that much about this potential problem. At least they were not bothered when they indirectly caused riots and other violence to come upon themselves. Perhaps a response to this would be, because they were instructed by the Lord to do their monologues. If that is the case, then who's to say I have not been? I take it I have. Further, the burden of proof seems to be on the individual detractor to demonstrate why I should not do what I do even if I am delusional about the Lord specifically instructing me. I was not instructed of the Lord to eat cereal this morning, so why would I have to have special instructions from Him prior to eating it? I submit that it's only micro-managers that try to get me to perform their chosen style of ministry. I understand the need to be "all things to all men, that I by all means might save some" (1 Corinthians 9:22, KJV), and I try to emulate that, but no one particular method is going to work with all people. The goal is to be like Christ and preach the gospel in all sorts of ways. And if you are always so worried about having everyone speak well of you, then you certainly are not following Christ. He said, "Woe to you, when all men speak well unto you! for so did their fathers to the false prophets" (Luke 6:26, KJV). As Walter Martin used to say, "We aren't here to win popularity contests." So if you remain faithful to Christ, you can expect to be hated, since the world hated Him first (John 15:18-21 and 1 Jn. 3:13). Further, other confrontational methods like simply passing tracts out to people in front of the temple are also deemed by LDS as highly offensive. Whatever legitimate rationale is used to defend simply doing this, the same legitimate rationale may be used for performing my preferred method. Of course, you may not even like the "confrontational" ministry of politely passing tracts out in front of the temple, but again, why try to micro-manage everyone into your particular likes and dislikes? The issue of "turn off" is not the issue. It is not the "trump card" to determine ministry approach. The issue is how can I best reach the masses with the gospel when people are dying and going to hell everyday? With this perspective, it becomes more understandable why I do what I do. It seems more reasonable to me that some things are worth the risk of offending LDS sensitivities if the message has a chance to get to them. Of course no one likes to be wakened up in the middle of night. But if one's house is on fire, the offense (whether by phone, doorbell, breaking windows, etc.) is understandably justified... and I dare say respectful. 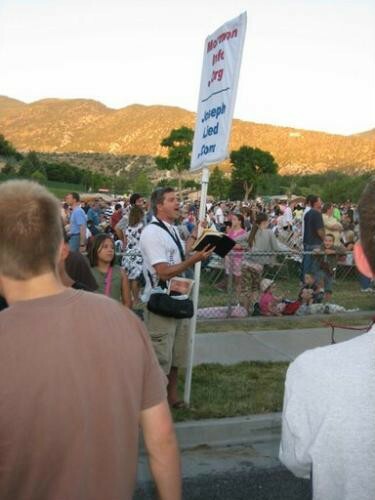 I judge that using a sign and preaching, among other methods, are of the best ways to get the word out to as many as possible. It is worth whatever offense is perceived. I know my motives are right before God, and people (LDS, and unfortunately even Christians) are always going to whine about them and my approach in this life. They will all stand before God like I will. I believe on that day they will all thank me for all the efforts I made to keep so many out of hell. Casting a net out on the water is going to repel a lot more fish than it will catch, but at least it will catch a lot more than fishing with a single pole! Both street preaching and friendship evangelism have a place in the Body of Christ, but stop demeaning the historically proven means of street preaching. "Shout it aloud, do not hold back. Raise your voice like a trumpet. Declare to my people their rebellion and to the house of Jacob their sins" (Isa. 58:1). Pray for and support Christian preachers as they attempt to reach the masses for Christ!